Bonjour, Connaissez vous l'architecte, le lieux ou le nom du projet? 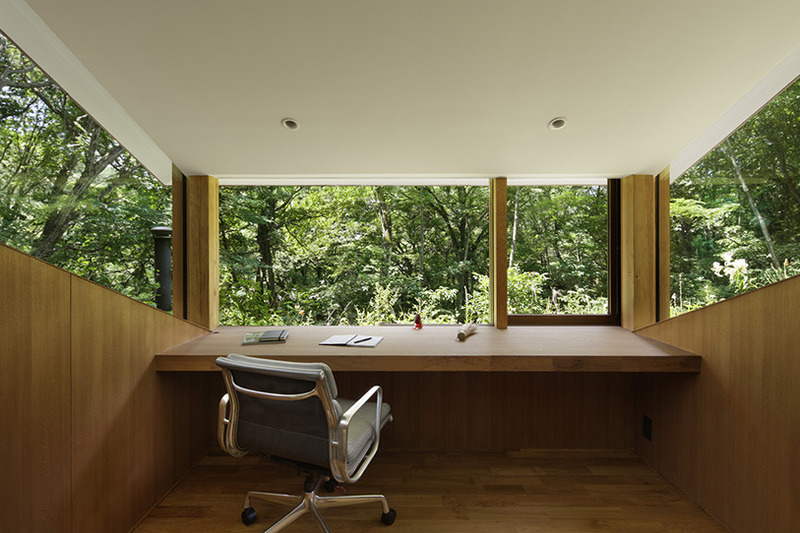 J'ai plus d'info même : This vacation home stands in a mountain forest in Karuizawa. 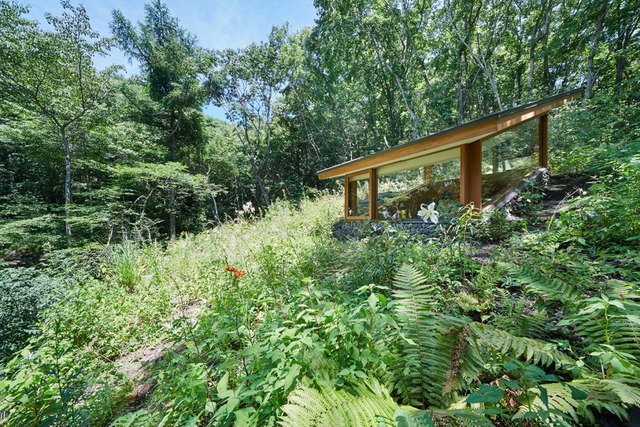 The south-sloping site had good drainage, was suffused by sunlight, and wildflowers bloomed on the deciduous-tree forest floor. 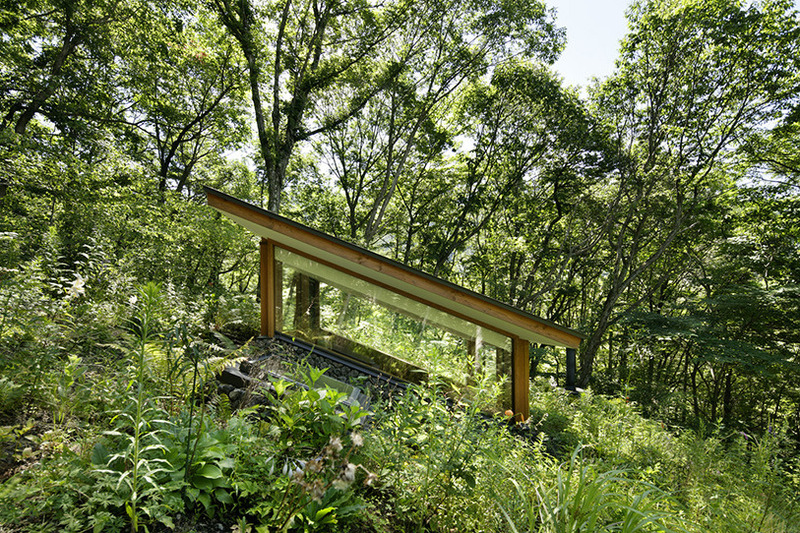 So as not to harm this delicate environment, I decided to minimize the amount of site preparation and elevate the slope slightly for use as a roof. Above the roof, for the sake of the owner who works when at home, we placed a study enclosed by glass on four sides from which to look out with a feeling of being in a cockpit. The wildflowers, being small, are normally overlooked when one is walking. In its cockpit form, the study becomes an observation room for enjoying dialogue with these tiny lives on an equal eye level, instead of looking down on them from above. Sunlight moving throughout the day filters through the flowers and pours inside as a gentle, diffuse light. Spring buds, fresh verdure, blossoming flowers, autumn colors, and falling leaves—the changes of the four seasons are reflected on the glass and time flows by. Having minimized the depth of excavation to avoid disrupting the water vein, an elevation difference was born. By giving play to that difference, however, we could create a plan utilizing gravity ventilation. In summer, when the dining room’s sliding door is put in its compartment, breezes ascend to the north side via the stairwell, where a bench space is established below a window for reading while enjoying the comfortable breezes. 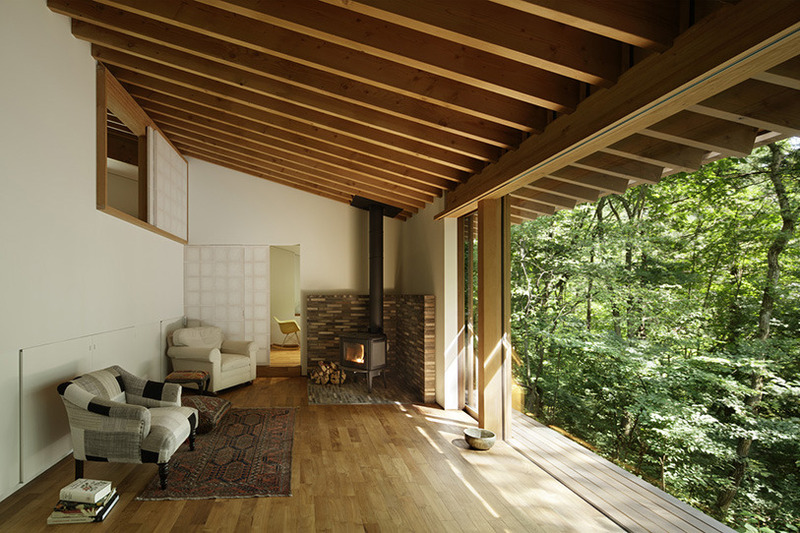 A living room with a fireplace is positioned in the lowest zone on the south side. 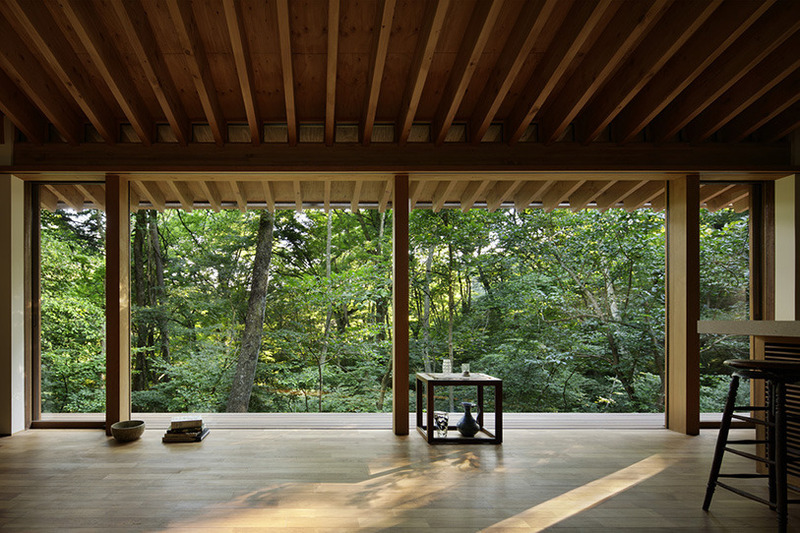 When going to bed late at night in winter, residents extinguish the fire in the fireplace and close the shoji doors in the highest zone. In this way, warm air from the living room is diverted to the bedroom. 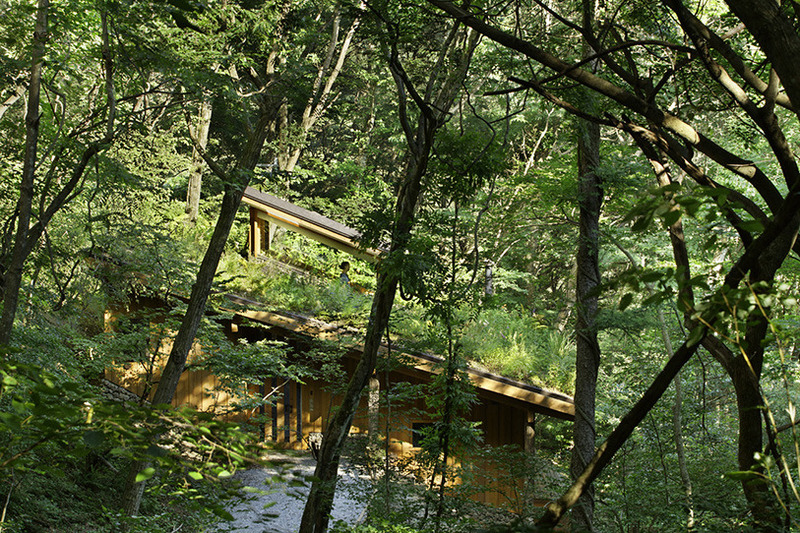 The exterior walls are composed of stone and lumber taken from the site’s surroundings. 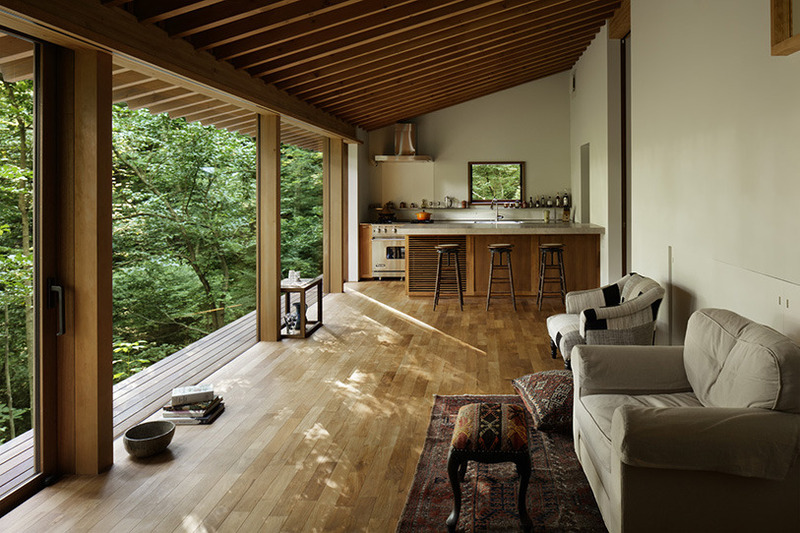 To bring out the presence of the small wildflowers, a design of quiet appearance has been maintained, with lacquer and wood walls for a relaxed vacation home atmosphere, a floor of Asama stone, and originally designed doorknobs and railings. After cutting chestnut and oak trees growing on the site, we dried their wood and used it in the porch pillars and door handles. 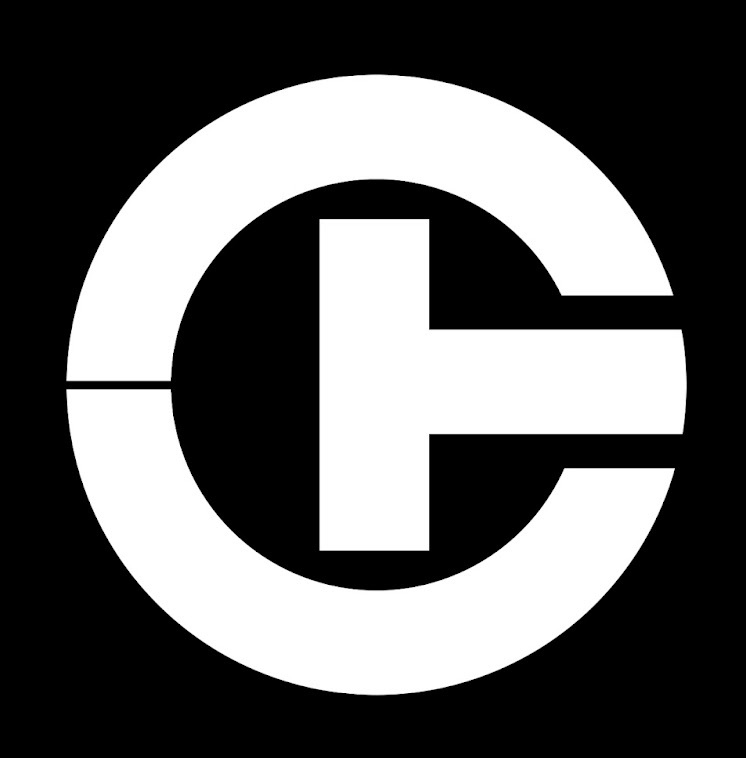 Contractor : TAKEHANA KOUGYO CO.,Ltd.